I love looking through stitch dictionaries in my spare time. I have even been known to leave one or two in the bathroom. 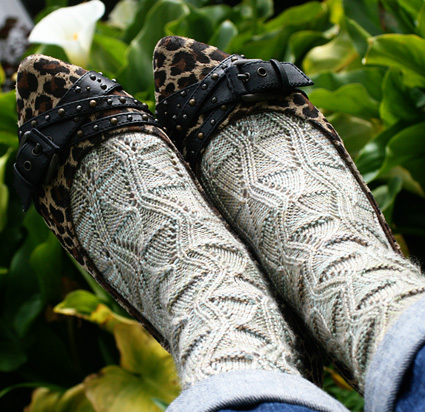 When I came across this lace pattern I knew it would make a lovely sock. In the book it is a ten-stitch repeat. That works well for a sixty-stitch sock, but what about larger sizes? 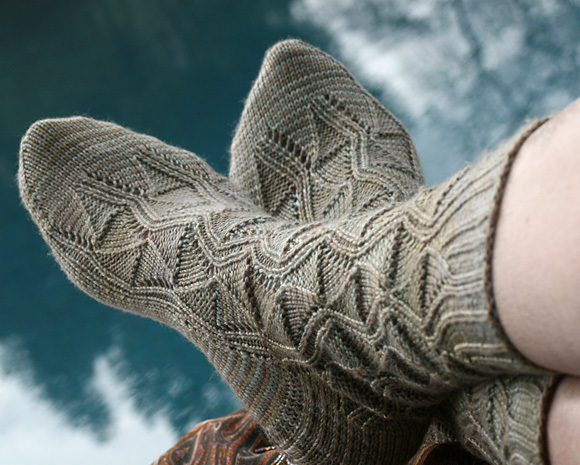 By altering the scale of the pattern I was able to design a sock in a multiple of sizes without changing the integrity of the design. The patterning on the foot is worked in a slightly unusual manner – instead of dividing the stitches evenly, there is one more stitch in the instep than in the sole – this allows the patterning on the foot to be symmetrical. Loosely cast on 60[66, 72, 80] sts. Distribute stitches as you prefer and join, being careful not to twist. Mark beginning of round. Round 1: Work chart row 1 for appropriate size around round. Note	that size XL uses the same chart as for size S.
Work as established following appropriate size. 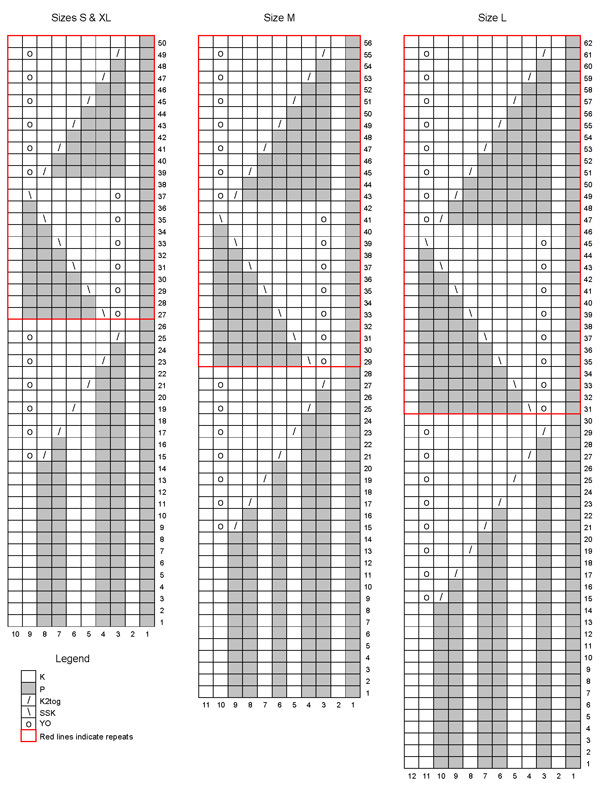 Once 50[56, 62, 50] rounds are complete, continue repeating only chart rows 27-50[29-56, 31-62, 27-50], working until leg is desired length. The socks photographed have legs 7 inches long. Turn so that WS is facing. Heel flap is worked back and forth in rows on 29[32, 35, 39] sts. Row 1 [WS]: K3, p26[29, 32, 36]. Repeat Rows 1 & 2 15[17, 18, 19] more times. 32[36, 38, 40] rows total. WS will be facing. This heel flap style creates a garter stitch edge which makes it easy to pick up the gusset stitches along the edge of the heel flap. Row 1 [WS]: Sl 1, p15[18, 19, 21], p2tog, p1, turn. Row 2 [RS]: Sl 1, k4[7, 6, 6], ssk, k1, turn. Row 3 [WS]: Sl 1, p5[8, 7, 7], p2tog, p1, turn. Row 4 [RS]: Sl 1, k6[9, 8, 8], ssk, k1, turn. Row 5 [WS]: Sl 1, p7[10, 9, 9], p2tog, p1, turn. Row 6 [RS]: Sl 1, k8[11,10, 10], ssk, k1, turn. Row 7 [WS]: Sl 1, p9[12, 11, 11], p2tog, p1, turn. Row 8 [RS]: Sl 1, k10[13, 12, 12], ssk, k1, turn. Row 9 [WS]: Sl 1, p11[14, 13, 13], p2tog, p1, turn. Row 10 [RS]: Sl 1, k12[15, 14, 14], ssk, k1, turn. Row 11 [WS]: Sl 1, p13[16, 15, 15], p2tog, p1, turn. Row 12 [RS]: Sl 1, k14[17, 16, 16], ssk, k1, turn. Sizes Small & Medium: 17 sts rem. Proceed to GUSSET. Row 13 [WS]: Sl 1, p17, p2tog, p1, turn. Row 14 [RS]: Sl 1, k18, ssk, k1, turn. Row 15 [WS]: Sl 1, p19, p2tog, p1, turn. Row 16 [RS]: Sl 1, k20, ssk, k1, turn. 17[20, 21, 23] sts remain after heel turn. Pick up and knit 18[19, 20, 21] sts along the side of the heel flap for right gusset. Place marker for start of round. Work across 31[34, 37, 41] instep sts following next row of appropriate chart for size being made and place a second marker for end of instep. Pick up and knit 18[19, 20, 21]sts along the side of the heel flap for left gusset. Knit the 17[20, 21, 23] heel flap stitches and the 18[19, 20, 21] right side gusset stitches. 84[92, 98, 106] sts total. 31[34, 37, 41] on instep, 53[58, 61, 65] on sole. Start of round is at start of instep sts. 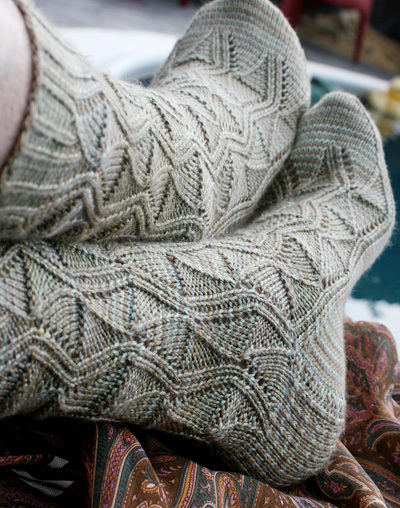 Decrease round: Work in pattern to end of instep; k1, SSK; knit to last 3 sts of round, k2tog, k1. 2 sts decreased. Repeat the above two rounds 11[12, 12, 12] more times until 60[66, 72, 80] sts rem total – 31[34, 37, 41] on instep, 29[32, 35, 39] on sole. Work even as established on 60[66, 72, 80] sts until the foot length reaches the base of the toes when measured from back of heel, removing instep markers on final round. Setup round: K30[33, 36, 40], place marker for end of instep sts, k to end of round. Decrease round: K 1, ssk, knit to 3 stitches before second marker, k2tog, k2, ssk, knit to 3 sts before end of round, k2tog, k1. 4 sts decreased. Repeat these two rounds [7, 8, 9, 9] times more, until 28[30, 32, 40] sts remain. Repeat decrease round 3[3, 3, 4] more times until 16[18, 20, 24] sts remain. Graft toe sts together with Kitchener st. Weave in ends. Block. 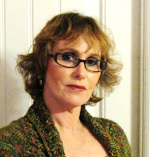 You can find more of Brenda’s designs here and here. She's on Ravelry as Beeeepatipaknits and Twitter as bpatipaknits.